A classic looking ladies watch which consists of a solid silver tone dial complete with stone set hour markers and luminescent hands, powered by eco-drive technology. Fastens comfortably using a black genuine leather strap. 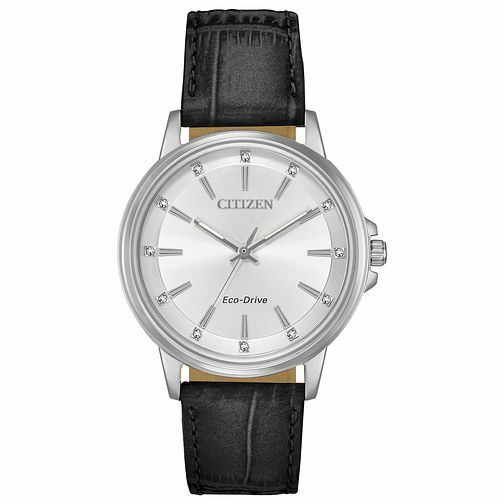 Citizen Eco-Drive Ladies Leather Strap Watch is rated 5.0 out of 5 by 2. Rated 5 out of 5 by Anonymous from Timeless style, time-only features I love this watch's style, it truly is a classic design, and the simplicity means it will never go out of fashion or look dated. In this era of smart watches and fitness trackers, it seems odd to want a traditional analogue watch with no smart features, but that's what I wanted, *just* the time, not even the date, simply the time only and powered by the light so I'd never have to mess about with it at the end of each month or when a battery finally dies (as with a regular battery-powered watch). The crystals on the hour markers are sparkly but not garish, it's an understated shimmer over the dial's soft starburst silvery reflections. About the only thing I can fault on this watch is that the second strap retention loop (furthest from buckle) is bigger than the first one (nearest the buckle), and can fairly easily slip away. It's a really minor point and is probably just the variance of a natural material such as leather. Rated 5 out of 5 by Anonymous from EXCELLENT watch Very stylish looks great.bought for me as gift very pleased.